If there is one ingredient we always keep on hand because of its versatility to whip up anything from a Sunday brunch entree to a quick but satisfying meal, it’s eggs! 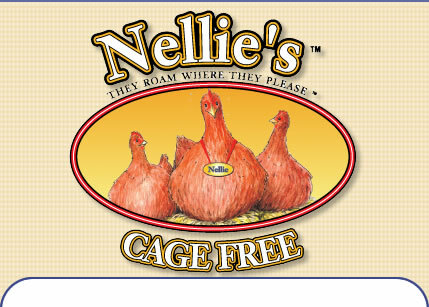 And now Nellie’s Cage Free Eggs (www.nelliesnest.com) gives everyone even more reason to love the versatile egg because each beautiful brown Nellie’s cage free egg contains 200 mg of Omega 3 and absolutely no antibiotic or hormones since these happy chicks “roam where we please” and are fed a diet including natural vegetarian grain. Nellie’s aren’t like most supermarket eggs with thin shells, watery whites and pale yolks – Break open a Nellie’s large brown egg and the yolk looks like the color of a morning sunrise and the taste is simply delicious. Great for hard boiling as a healthy snack, for using in breakfast and brunch omelettes or for creating a delicious frittata or spinach-rocotta cheese pie! We also love the clear packaging that uses recycled water bottles and which is as transparent as Nellie’s promise that you are going to love these cage-free eggs, produced under humane conditions at 40 small family farms throughout the Northeastern U.S.
Nellie’s Cage-Free Large Brown Eggs – Gotta Love It!